Los Angeles is the second largest city in the USA after New York. Countless attractions and a location on the Pacific Coast bring more than 40 million tourists to the metropolis every year. As well as that, the annual Oscars ceremony held between February and March also attracts tourists. Would you also like to visit this Californian city? Then come check my detailed travel guide for the best time to visit Los Angeles. I’ll tell you all about the climate of the city in a handy climate chart, where you can see the temperatures, the number of sunshine hours and rainy days, and the water temperature in Los Angeles. Whether you’re looking for a couple of days on the beach or want a sight-seeing tour through the city, here you will learn everything worth knowing about the best time to visit the City of Angels. When are there forest fires in Los Angeles? Los Angeles is found in a subtropical climate zone. The average annual temperature is about 18 degrees Celcius. In summer, the average temperature is 25 degrees, and in winter it can be a reasonably mild 15 degrees. January is the coldest month of the year, at seven degrees. By contrast, August is the hottest month of the year. In this month temperatures can be about 28 degrees Celsius. Thanks to the cool winds that come inland from the Pacific Coast, the warmest temperatures in the summer are a little more pleasant. In autumn, the temperatures sink to a minimum of about 11 – 16 degrees. It’s not uncommon that travellers enjoy a warm 24 degree Celsius city in November. From September, the nights can get a little cooler. So, I do recommend that you bring something warm to wear in the evenings. In the months of January, February and December the temperatures can fall under 10 degrees. The maximum temperatures in winter are around 18 degrees in January, and 19 degrees in February and December. Los Angeles has a climate that’s quite comparable to Spain. Together with July, August brings the most sunshine. However, with an average of seven to 11 hours of sunshine a day, travellers can expect a sunny outlook throughout the year. Together with October, January is the month with the fewest hours of sunshine. The most rainfall occurs in winter and in spring. There are an maximum of four rainy days in December, January and March. There are an average of three rainy days in February, April and November. May is the only spring month with just one day of rainfall. The least rain falls from June to September, when these months have an average of zero rainy days. The water temperature in summer is around 18 degrees in June and 19 degrees from July to September. The Pacific is at it warmest in August at 20 degrees. From October, the water cools again and reaches 14 degrees, its lowest point, in January and February. From March the water temperature rises again. The weather in Los Angeles is quite consistent throughout the year. Therefore, every month is a good time to visit the City of Angels. The best time to visit Los Angeles is between May and October. In these months, holidaymakers can spend an average of 11 hours a day in sunshine and enjoy no rainy days in the Californian metropolis. During the summer there is always a fresh sea breeze. Because of it, the summer temperatures feel a lot more pleasant. For people who aren’t as keen on warmer temperatures, spring and winter are the ideal time to come for a visit. May: 23°C, 9h sunshine, 1 rainy day, 17°C water temperature. June: 25°C, 9h sunshine, 0 rainy days, 18°C water temperature. July: 28°C, 11h sunshine, 0 rainy days, 19°C water temperature. August: 29°C, 11h sunshine, 0 rainy days, 20 °C water temperature. September: 28°C, 9h sunshine, 0 rainy days, 19°C water temperature. October: 25°C, 7h sunshine, 1 rainy days, 18°C water temperature. Are you a sun seeker? Then the best time to visit Los Angeles for you is the months of July and August. In this time holidaymakers can expect an average of 11 hours of sunshine per day and no rainy days every month in the city. Summer is perfect for a beach holiday in Los Angeles. In July and September the water temperature is 19 degrees Celsius and in August it reaches its peak of 20 degrees. In this time you can definitely relax on one of the beaches in Los Angeles. A steady breeze from the Pacific coast makes it easier to enjoy the days midsummer. You can spend the days relaxing on Santa Monica beach and let the sun shine down on you. After that, you can take a wonderful walk on Santa Monica Pier and watch the surfers surfing. Or, you can enjoy the fantastic weather on the famous Venice Beach. This beach lies just a few kilometres from Santa Monica Pier. Here, you can watch sports men and women on Muscle Beach while you soak up the California sunshine. The water temperature in Los Angeles is between 14 and 20 degrees. Depending on sensitivity, water from 21 degrees can be perceived as pleasant. But this temperature doesn’t reach the Pacific on the beaches of Los Angeles. If you go swimming during your holiday, you should keep moving in the water as much as possible. This is the only way to keep your body cool. To see the sights of Los Angeles, spring is the best time to travel. The months of March, April and May have mild daytime temperatures of 21 to 23 degrees Celsius which are ideal for a city break. A hike to the Hollywood Sign is much more pleasant in these temperatures than it would be in summer. As well, the weather in winter is characterised by milder temperatures. In December, January and February you can take up some daytime activities in the 18 to 19 degrees Celsius heat. Visit the famous Walk of Fame on Hollywood Boulevard or walk through Griffith Park at the eastern end of the Santa Monica Mountains. In winter, most of the rainy days of the year await you. So don’t forget your rain jacket! With water temperatures of 14 – 17 degrees Celsius, a beach holiday in spring and winter is only something for die-hards. Although the weather is good year round, with mild temperatures and few rainy days, a trip to Los Angeles during the winter months is the cheapest. On an evening between February and March, the annual Academy Awards will be presented in Los Angeles. Around this day, the prices for your stay in the city increase. Before booking, check online for when the next Academy Awards will take place. Booking outside this time will hopefully save you some money! When are the forest fires in Los Angeles? Every two to three years the city experiences real heat spurts . From June to November there is always a high risk of forest fires. In summer, temperatures during this time are more than 40 degrees Celsius. Because there are few rainy days, the forests and meadows of the Californian city are sometimes very dry. Negative effects on the drought have the Santa Ana winds from the east. The dry air of the warm desert winds increases the forest fire danger in Los Angeles considerably. Only in the summer of 2017 broke the biggest fire in the history of the city. The fires in California are often difficult to extinguish and pose a threat to the both population and to travellers. In the summer, before flying to Los Angeles, be aware of reports of bush and forest fires. Los Angeles is perfect for a trip every month, because the weather is subject to only small variations throughout the year. The number of hours of sunshine is high year round, and the rainy days of each month are very low. In general, the best time to visit Los Angeles is from May through October . These are the months when the climate is best for a trip to California’s Pacific Coast. The number of hours of sunshine per day and the temperatures are at their highest. On average, it rains one day a month during this period. And also the waters of the Pacific are warmest on the beaches from May to October. The best travel time for Los Angeles depends on the planned activities. The mild temperatures make spring and winter suitable for a city ​​break . During this time you best explore the sights of the metropolis. Due to the low water temperature, swimming in the Pacific in spring, autumn and winter is no sign of chilblains. If you want to spend a beach holiday in the largest city in California, you should travel to Los Angeles in June, July or August. In summer, hollidaymakers enjoy sunny weather with no rainy days. However, because of the optimal climate, you have to be prepared for full beaches and higher prices for your trip. 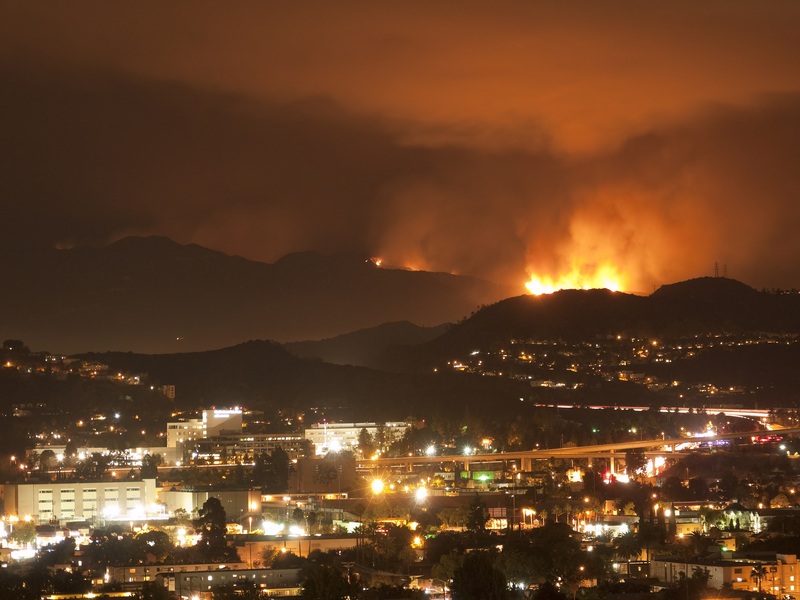 Los Angeles fights heavy forest fires every two to three years in the summer, These are dangerous for the population and for tourists. Therefore, I recommend that you check the media for reports on the current weather conditions before you travel to the city of California.